As an amiibo, Sheik is out of her element. Her moveset is catered to combos and aerials – both of which are frowned upon in the current metagame. Yet Sheik still has a skill set strong enough to make her a threat: for example, her jab hits multiple times and helps rack up a lot of damage in a short span of time. Her recovery is quite good as well, granting acceptable vertical and horizontal distance. Sheik can also juggle opponents with her forward tilt and attack with a fast set of smashes. Unfortunately, Sheik suffers from several flaws, the most notable of which being her low attack power. Her moves are fast, but not the slightest bit strong, making it tough for her to seal the deal with a KO. This issue can, in part, be patched up with boosts to her attack stat, but her KO power will still pale in comparison to stronger fighters like Bowser and Ganondorf. Sheik’s AI also has a few odd tendencies: she may use her side and up specials improperly and at random, giving foes a great opportunity to strike. 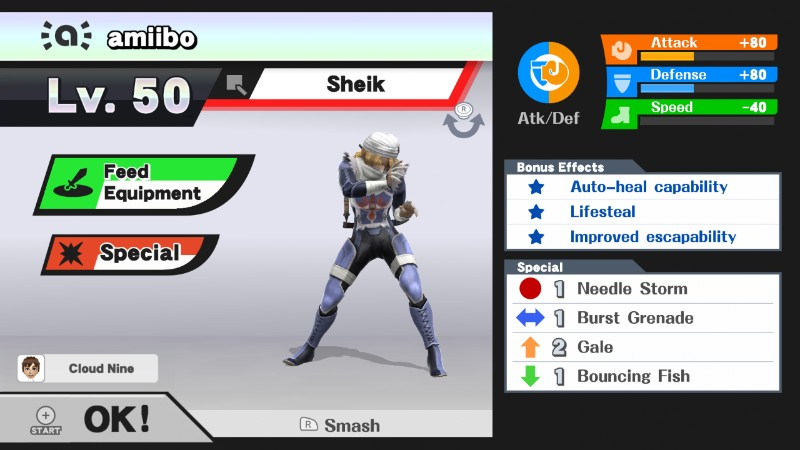 Finally, Sheik is a lightweight. Not only are her attacks weak, but she herself cannot take many hits before getting KO’d. Sheik has her fair share of flaws, but thankfully, she has enough advantages to make her worth training. She’s a rare sight in tournament play, and most tourney entrants will not have prepared to fight this character. 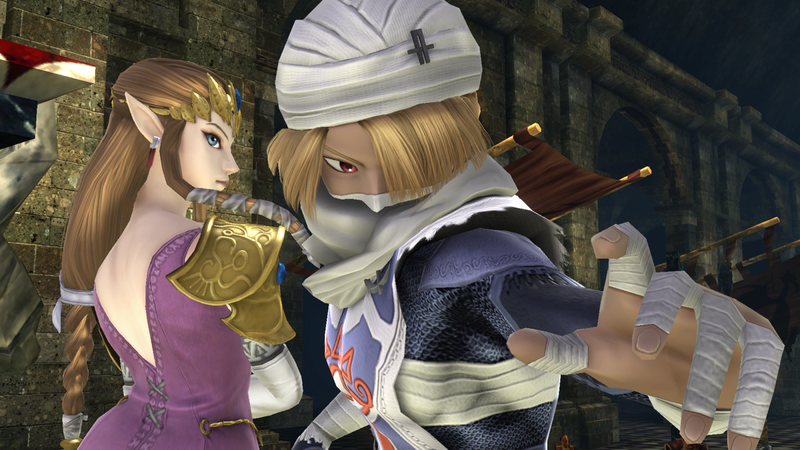 This can put Sheik at a tactical advantage – with the element of surprise on her side, her chances of victory increase. Gale: This is a custom move version of Sheik’s up special. Gale deals no damage but is much quicker. It’s Sheik’s safest recovery move, and its high speed prevents her from getting gimped by projectiles from characters like Mario and Link. Neutral options: jab and forward tilt. Sheik’s jab is fast. Really fast. Its blinding speed can catch opponents off guard. Jab is one of Sheik’s most important moves, so be sure to use it often during training. Forward tilt is fast but doesn’t deal much damage. However, it links into itself and can juggle enemies with proper timing. Main KO moves: forward smash and down smash. These moves are pitifully weak, but they’re Sheik’s only options. Forward smash is most consistent, but down smash works in certain situations as well. Moves to avoid: side special and down special. Neither of these moves bring Sheik much benefit. She tries to use Burst Grenade to approach, but this never does her any good. She also can’t learn to use Bouncing Fish as an off-stage gimp. Situational moves: Needle Storm. Always keep Needle Storm fully charged, even if you don’t intend to use it. When you’re far away from your amiibo, fire the needles to close the gap. You can also kind of gimp your amiibo with Needle Storm if its positioning is correct. Thanks to Blue for compiling Sheik’s information. Images are courtesy of SmashWiki and the official Super Smash Bros. website.